The FRED database (maintained by the St. Louis Federal Reserve Bank) has added 40 series that are the output of the arbitrage free term structure model based on the paper by Kim and Wright. These data are used by Fed researchers to try to explain away what is happening in the bond market. 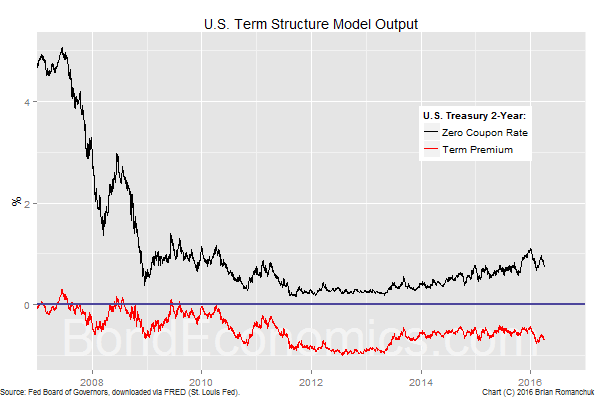 The chart above shows model outputs for the 10-year maturity: the 10-year zero coupon yield, and the term premium. 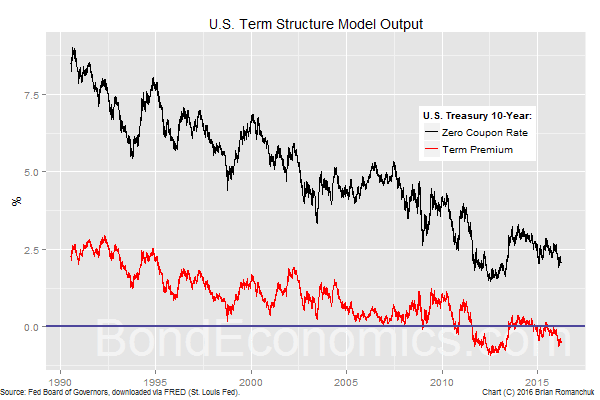 (This primer explains what a zero coupon yield represents.) Please note that the data end as of March 2016, and so we can only use these data for historical analysis, and not to see what the market is pricing "right now." The 1-year instantaneous forward rate is the forward level of the overnight rate, one year from now. Since the zero rates are an average of instantaneous rates, they are less extreme. For example, the 10-year instantaneous term premium could be much larger than the term premium embedded in the 10-year zero rate. Why Would We Want To Use These Data? The rate expectations view of interest rates states that observed bond yields are equal to the expected average of the overnight rate over the lifetime of the bond. (Link to a primer on rate expectations.) This is why bond market participants appear to obsess over central bank watching: policy trends at the central bank determine the fair value for bond prices. The value of this theory is not necessarily from its predictions, rather what it rejects. The notions of "supply" and "demand" do not enter into the strictest version of the theory. As a result, it explains why we can reject a lot of crackpot theories about bond yields, such as the belief that Japanese bond yields are going to rocket higher any day now as a result of Japan's relatively high debt-to-GDP ratio. The term premium needs to be added as a corrective term to the rate expectations formulation; bond yields (and forward rates) will have an upward bias relative to the expected path of the overnight rate. Although the theory can easily absorb such a correction, the practical problem is that there is no agreement about the level of the term premium at any given time. I prefer fairly simple methods to fix the term premium, but academics and central bankers have moved towards complex models that generate an implied term premium. The Kim and Wright paper is a standard model that is used, but academics have churned out many more. For someone like myself, having the model output being published makes life much easier. It is now possible to analyse the model output, without having to get the underlying data set, and implement the fairly complex algorithm. What can we use this model for? What predictive properties does the model have? I expect to return to these questions in later articles.